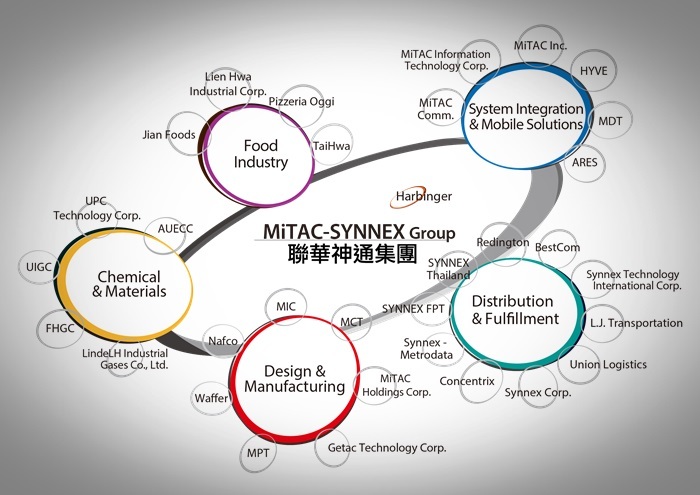 The MiTAC-SYNNEX Group has witnessed Taiwan’s economic growth over the past sixty years. In the past decades, the MiTAC-SYNNEX Group has expanded its scope of businesses to the computer & consumer electronics, IT distribution, software development, system integration, materials & petrochemicals, industrial gases, transportation & logistics and food processing industries. The MiTAC-SYNNEX Group includes six listed companies : MiTAC Holdings Corporation (TWSE: 3706), SYNNEX Technology International Corporation (TWSE: 2347), UPC Technology Corporation (TWSE: 1313), Lien Hwa Industrial Corporation (TWSE: 1229), Getac Technology Corporation (TWSE: 3005); and SYNNEX Corporation (NYSE: SNX).